Have you ever had something so many times that you don't realize that you haven't shared it? That's what these Cinnamon Applesauce Cookies are for me. This is a recipe that my mom makes every year, the one reason I always make sure to have cinnamon chips in the pantry. The applesauce in these cookies makes them so incredibly moist that it's almost unreal; plus, I love anything with cinnamon! So simple and easy, but so deliciously good. Give them a try - you'll thank me later! Beat butter and sugars until creamy. Add eggs and vanilla, beating until thoroughly mixed. Add flour and baking soda in intervals on low speed. Stir in applesauce and then cinnamon chips. Drop by teaspoon 1" apart on cookie sheet and bake at 350 degrees for 10-12 minutes. Remove from cookie sheet and cool on wire rack. To make the glaze, add milk or water to desired consistency to powdered sugar. To drizzle glaze, make a thin mixture, and to frost cookies, use a thicker glaze. 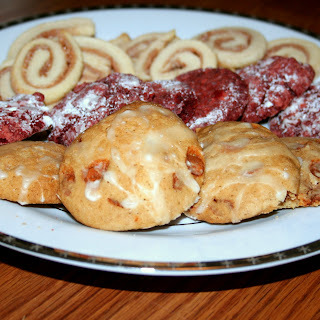 When cookies have cooled, drizzle or frost with glaze. Allow to harden before storing. These cookies will keep in an airtight container for up to 2-weeks, but also store very well in the refrigerator and stay softer that way. They also freeze very well. I love anything with cinnamon chips. Those look tasty!